Eight years ago, the five of us went to Mecca and Medina to do our Umrah. We came back and immediately signed up with Tabung Haji to do our Hajj after having such a great time 'visiting' the Kaabah. I’ve waited eight years for this moment. To receive the letter from Tabung Haji saying that “you’re on standby.” Well actually we’ve received that letter since a few years back but it only seems right to go this year what with my brother done with his university and all. But my point is, I’ve waited for eight years, had myself prepare for eight years to do the Hajj. Hajj is a huge thing, a big thing, a spiritual thing. Even if you have all the money in the world, but if you’re not ready to be a guest of Allah, I don’t understand how some people can do that. To be a guest of Allah, the question is "are you really ready?" Have you done everything He asked you to do for as long as you’ve lived, away from the holy city? I admit that I’m not sure if I’m really that ready yet but I’ve had my share of eight years of getting ready. Maybe God knows better that even I am not ready to face the challenges awaited in the holy cities. Now what about some who only decided to go on last minute? But everything is in God’s hand. Like my mother said, He’s the best master planner. Who am I to judge who’s ready or not to be His guest. He invited them already, and He didn't invite me. There must be a Hikmah out of all this. I’m sure of it. It’s not clear yet what is it that God wants me to learn from all these, but I know there’s ALWAYS something. So now, I’ve just gotten back from sending the four people closest to me off to do their Hajj. I’m in my parents room as I'm writing this, trying to feel as close to them as possible even if we're physically apart. To say I’m crying now is a lie because I’m not. I guess I’ve ran out of tears. I’ve been crying since a few months ago. And the tears have been flowing more rapidly for the past few weeks. Don’t let me start on the last few hours I had with them. I can’t believe it, (okay tears are rolling down now) I’m all alone right now. Sure, I have other relatives and friends here in KL but… Nobody seems to understand what I’m going through, nobody. Other people when their parents do the Hajj, they have their siblings to hang on to each other. I have no one. Not my parents, not my brother and not my aunt who was my roommate since I was nine. 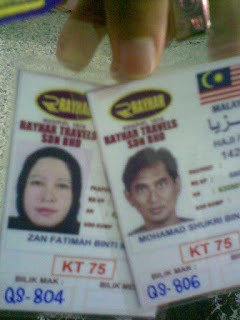 Ibu, Papa, Wawan, and Mak Ina, I love you guys tremendously. Seriously, no words can actually express it. If it’s up to me I don’t want to let go of any of you just now. But I have to. And that’s the reason why I didn’t look back when I walked off. Or else I know the tears will start rolling again and you would get worried. I want for you instead to go do your Hajj in peace with the knowledge that I’ll do my best to keep myself out of trouble. I want you to do your best and insyAllah come back with Haji Mabrur. Starting from tonight I will keep on praying for your safety there. When you come back I promise there will be no more tears. p/s: If it’s up to me I don’t want to end this entry. I want to keep writing to tell the whole world how much I love you guys and are missing you guys so much right now. But as what I did just now, I need to let you go. You are now honorary guests to The All Mighty. Send my Salaam to Rasullullah S.A.W. Take care.